Himawari means “sunflower” in Japanese, and that’s exactly what this ramen restaurant in downtown San Mateo reminds me of. Bright, cheerful and upbeat, it’s the perfect spot to grab a bowl of brothy noodles on a chilly day. Himawari is a casual restaurant and is especially ideal for lunch. Make sure you’re not too hungry when you arrive, though, as this restaurant gets busy and the wait can be long. Standing around for a table didn’t bother me much; the staff is so friendly and the eclectic jazz playing over the speakers is so good that it’s hard to get peeved. 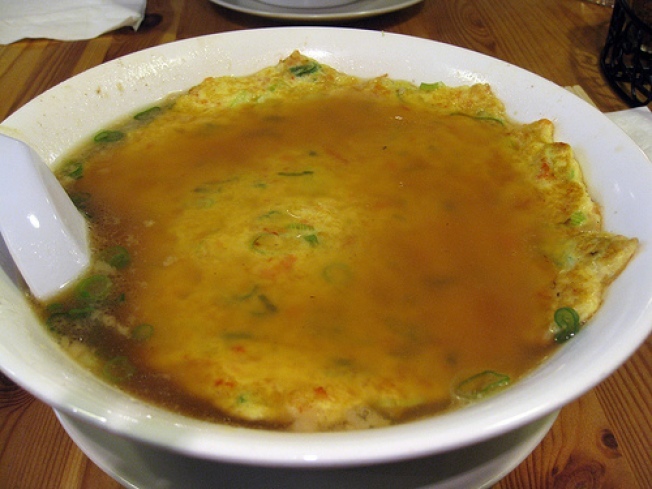 I ordered the kanitama ramen, which is a snow crab omelet served over soy ramen. The broth at Himawari is good enough on its own, but each table has a canister of fried garlic and chili flakes for sprinkling if you’re craving extra flavor. I couldn’t resist, of course. The noodles were better than most other ramen restaurants too, including those at more popular competitors. I was disappointed in my snow crab omelet though; the crab was minimal and I could hardly taste it. That being said, the omelet was fluffy and was great for sopping up broth. The ramen is great, but it’s the ambiance at Himawari that really makes it worth coming back to. I can’t think of a better place in the Peninsula more suitable for a fun, quick, cold weather meal.